When I first heard that there was a place in the US where cars were banned and travel was limited to foot, bicycle and or horse-n-buggy, I thought — this is a place where I need to be. 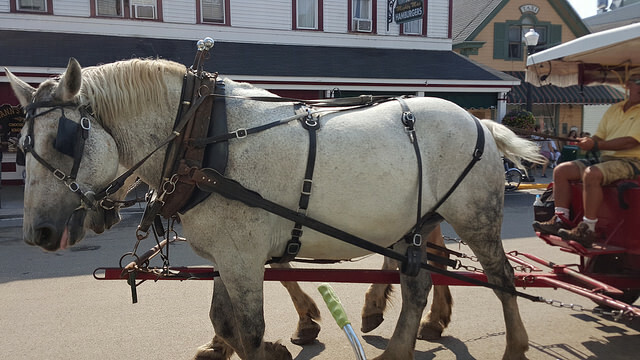 Since the late 1800’s – cars have been banned on Mackinac Island, Michigan. 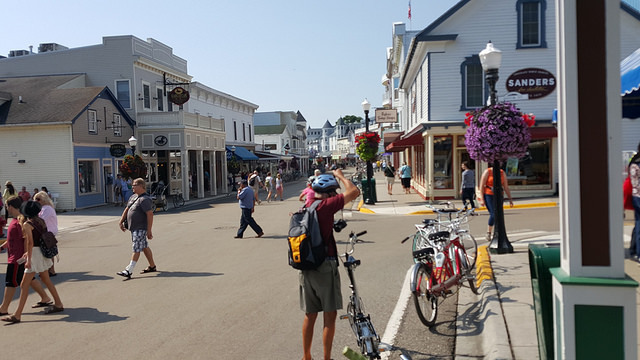 Located amidst the Straits of Mackinaw — where Lake Huron and Lake Michigan meet separating mainland Michigan and the Upper Pennisula – is Mackinac Island. Accessible only by Ferry, the island is known for continuing it’s car-less tradition, promoting bicycling or foot travels and no shortage of handmade chocolate and fudge. Bicycling, followed by chocolate. It doesn’t get any better than that! 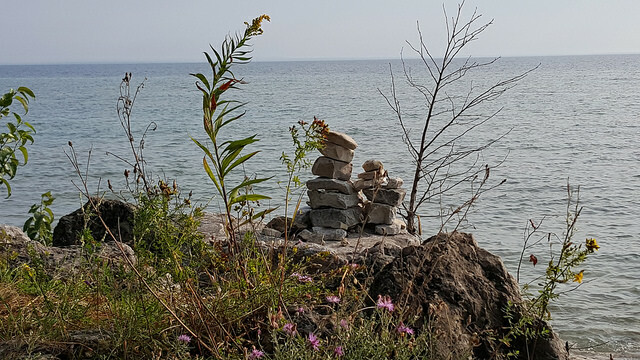 Lake Huron, the Mackinaw Bridge and the Upper P. It doesn’t take much to convince your mind that you can even see the shoreline of Canada. The first ‘lap’ around the island consists of slow motion pedaling, frequent stops to take pictures, more stops to look at the ships, ferries and sailors, and before you know it you are back on ‘Main Street’ where aromas of fudge and homemade chocolate are in the air. The need to ride fast, or be in a hurry dissolves when you realize that cycling in slo-mo allows you to savor the aromas of chocolate. 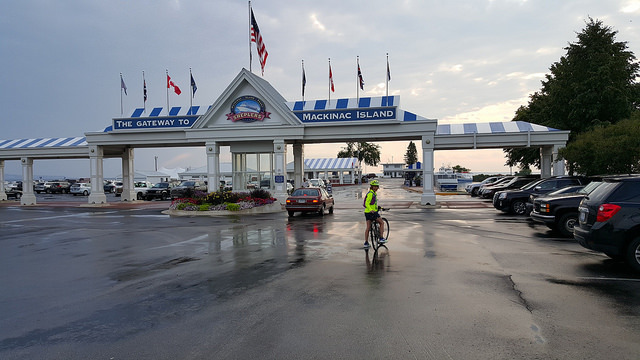 Apparently everyone who knows anything about bicycling, and those who just suddenly think bicycling might be a good idea – by 11 AM converge onto Mackinac Island. Fortunately, we made it to the island the moment the first Ferry departed from the mainland (8:30AM) and had time to get in multiple laps around the island before the humanity arrived. 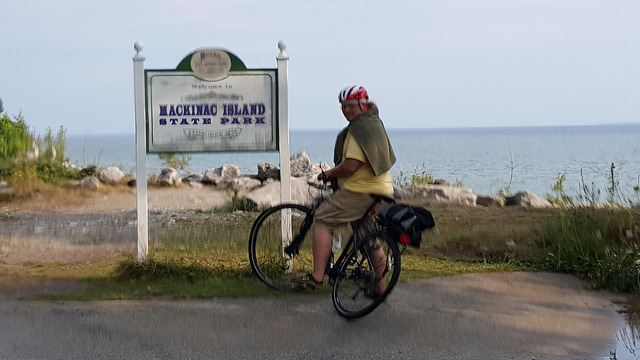 By noon, the roads had morphed into a sea of cyclists, and we knew it was time to return to Mackinaw City on the mainland — to find more bicycling of course. Streets – void of cars!! Jane, you didn’t tell us you were going here. We were at the Grand Hotel from August 11 through check out on Saturday, August 15. We left the island about noon on Saturday. Talk about timing. Let’s compare notes when you are back home.